I suppose you could say that Easter heralds the start of the wedding season every year. I heard recently from a waiter in Maryborough House Hotel that the number of weddings in Ireland has increased in the last few years and hotels are busier than ever with their wedding business. If you are invited to a wedding over the summer, something for the newlywed’s garden would be sure to make an interesting and novel present. Cornus Controversa, otherwise known as the Wedding Cake Tree (pictured) would make a beautiful present. It is the quintessential small garden tree. Its beautiful wide spreading horizontally tiered branches are what makes it so special and what gives it its common name. 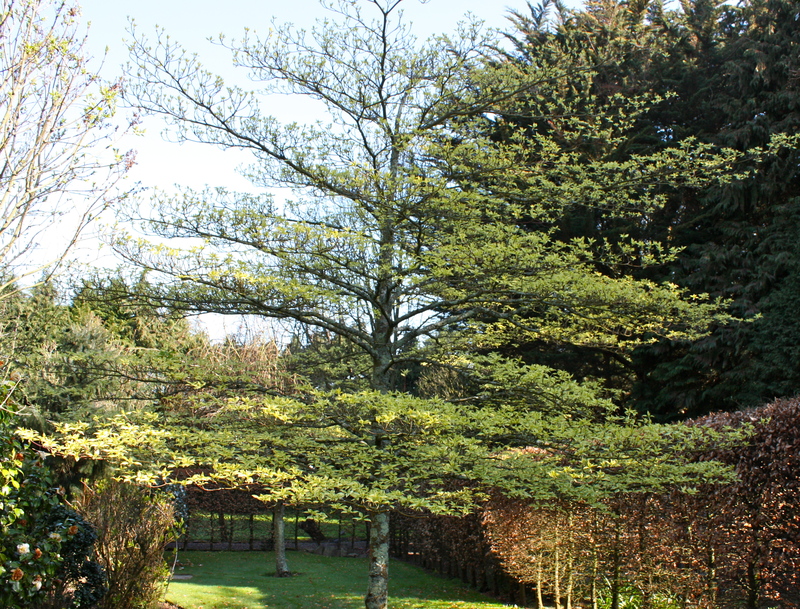 Its bright green foliage with creamy coloured margins turns yellow in autumn. Blue-black fruit follows small white flowers in summer. Exochorda ‘The Bride’ is a wonderful spring flowering shrub and would make a sentimental and romantic wedding present too. It can be grown as a shrub or as a climber. I have two in my garden each doing different things. 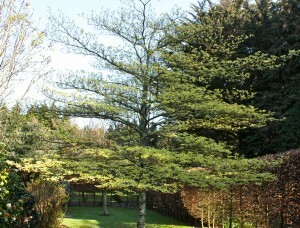 One is in a large bed and the second is trained as a climber on a northeast-facing wall. They are beautiful at the moment and their abundant showy white flowers never fail to impress. ‘The Bride’ can grow to ten feet in height and six feet wide. A fertile well-drained soil will do and full sun or dappled shade suits as well. Lily of the valley is also associated with weddings as its dainty highly scented flowers are often used in bouquets. Plant one and you’ll find that it will naturalize easily. It prefers a damp shady spot and flowers in May. – Organise an Easter egg hunt!